I can see the finish line from here! With the completion of these paintings, the number is now at 95. I have varied my size of the images a little, using scraps of paper and form board. The top two were done on Wallis and the snow, the dark and the autumn with black undertone were all done on black Canson paper. The pastels were mostly Unison and Diane Townsend. 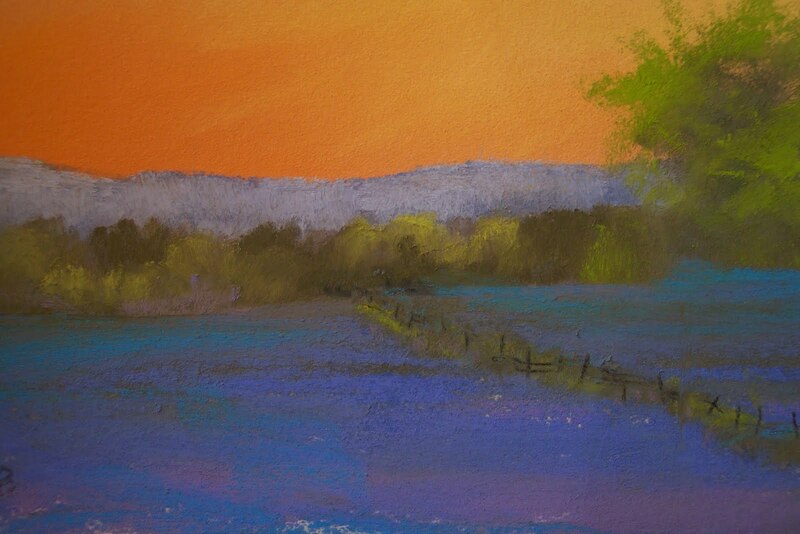 With the Canson paper I also used some Nu pastels after the softer Unison and D. Townsend ones. 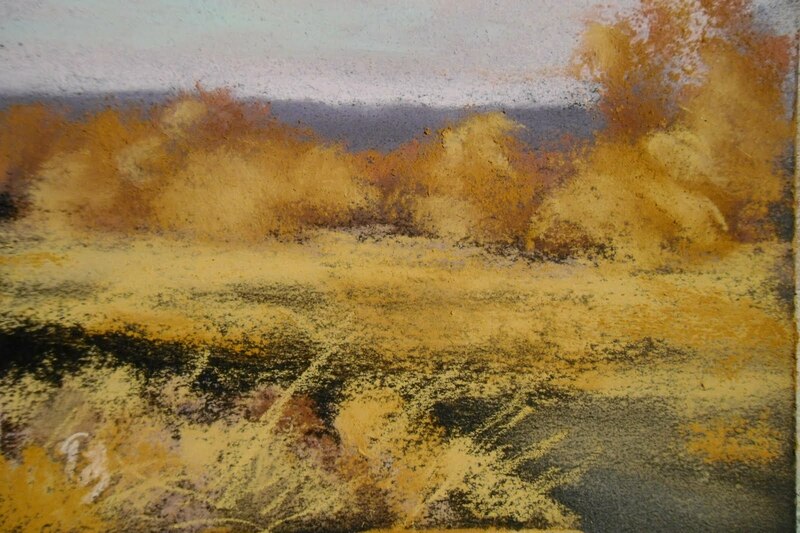 I like to create texture with using the hard pastels in a burnishing manner in certain areas of the painting and then leaving some of the color of the paper coming thru to give a sense of a path or trail. 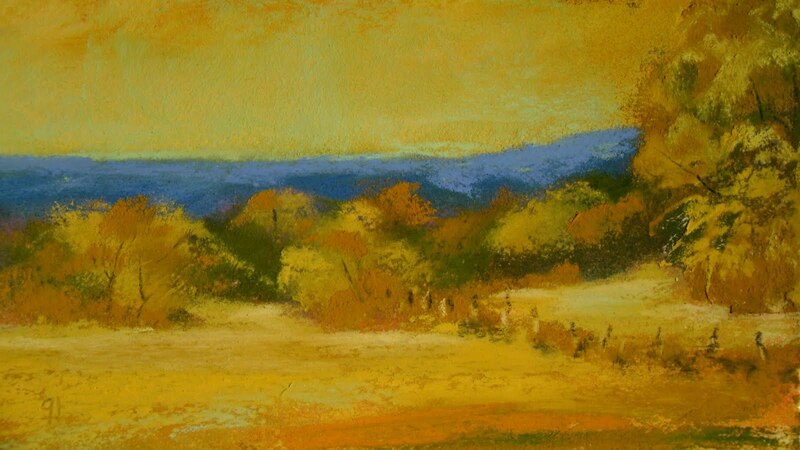 The DT pastels work well with the Canson paper, particularly the Terrage’ ones because of their grit. I’ve said this before, but worth repeating because it makes using the Canson paper easier and the results are interesting and easy to come up with. The end of the month brings the Willow show to a close. It was a good show and some things sold. A fabulous artist, Katherine Treffinger from Cove, OR will be part of the mix of June-July artists at Willow and I encourage people to stop in and see the show. 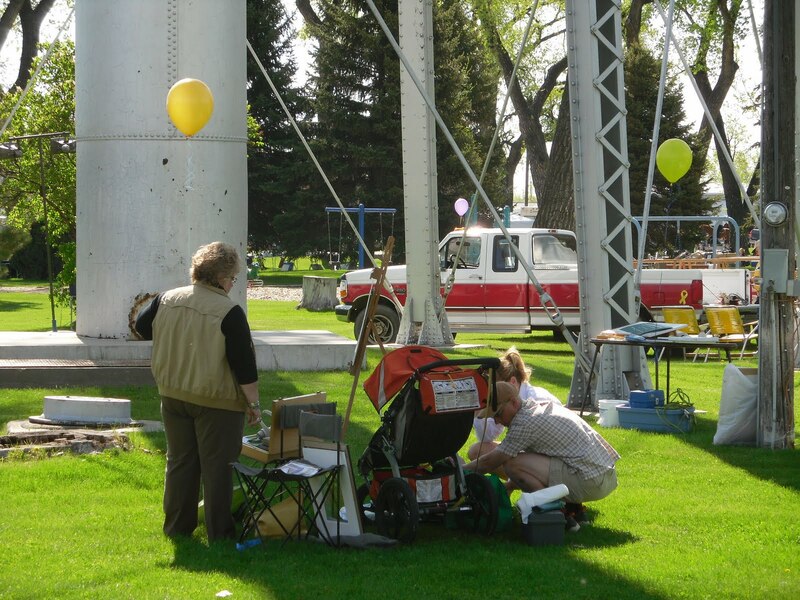 The middle of next week I go to Joseph, OR to the Wallowa Valley Festival of the Arts and take part in the plein air event, the quick draw and the juried show. It is a favorite show. 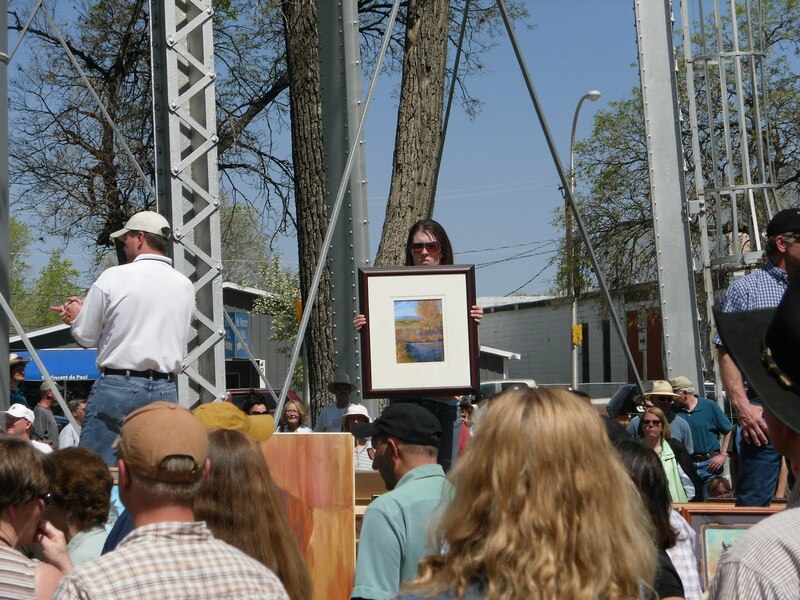 One hopes for great weather because of the plein air events, but it will be what it is and regardless of the weather, it will be a great time! I am planning by the end of the weekend to have finished the series of 100….that’s my goal, anyway! So in the meantime…happy painting! Sheep markers…what is THAT and WHAT do they have to do with painting??? Well…here is a little back ground and what has promoted this topic! When I lived in central Montana growing up, I remember an artist who lived in a near community, raised sheep, had lived in Paris and studied art, was married to a French woman he met in WWII, and was an author as well. His art was abstract to impressionistic; certainly not the Charlie Russell/Frederic Remmington type of painting that was so popular among the western art lovers. I remember his work and thinking it was really interesting…that he was going out on a limb with his work and could only assume that he was painting for what he believed and loved. Bill Stockton was a colorful figure – he was raised in Fergus County, MT but after WWII chose to go art schools in the midwest and Paris. He exhibited nationally and his work is now part of the permanent collection at the Yellowstone Art Museum in Billings for one. As an author he wrote a book, called “Today I Baled Some Hay to Feed the Sheep the Coyotes Eat.” I have not read it, but am on the quest to find a copy of it and read it. A few years ago I did a solo show at the Lewistown Art Center and there were a few pieces of Bill’s illustrations of lambs and ewes and some of his other sketches and paintings. Some of the paintings were done with SHEEP MARKER!! I had never known what “sheep marker” really was. I had seen sheep with markings on them, identifying them in some form to their owner and it looked like a paint of some sort. Occasionally you would see numbers drawn on horses and cattle at a livestock auction as well. A few months ago, I came across some work in a gallery that was done by an artist and they were interesting, abstract renditions and were accomplished with SHEEP MARKER! I decided that I needed to give this medium a test drive and called the local farm/ranch supply store a call asking for sheep marker. Nobody knew what I was talking about. Well, I didn’t either. I wasn’t even sure how this stuff was supplied (or how you applied it to cattle, sheep or canvas)! So I put it on the back burner until last week when I was in eastern Montana. There’s a Murdock’s Store there and they are an “everything” store from sporting goods to clothes, boots, hats, pet supplies, everything you might need if you are a rancher from fencing supplies to branding irons to…When I got to the isle where the branding irons were I knew I would find sheep markers! Well, they are called “Livestock Markers” and they are sticks of colored oil paint in very basic colors. I don’t think there is much in the line of quality control with color because there were several shades of green all with the same item number! But here they were and less than $2 a stick and the sticks appeared to hold quite a bit of paint! So, I bought several colors and brought them home. On the stick it says to cut the tip off of the stick to expose the fresh paint…that’s the instruction. OK…so last night I got out a couple of smaller canvases, cut the tips off some of the paints, grabbed a knife and started putting some color to the canvas. The above images are the results. It was fun! 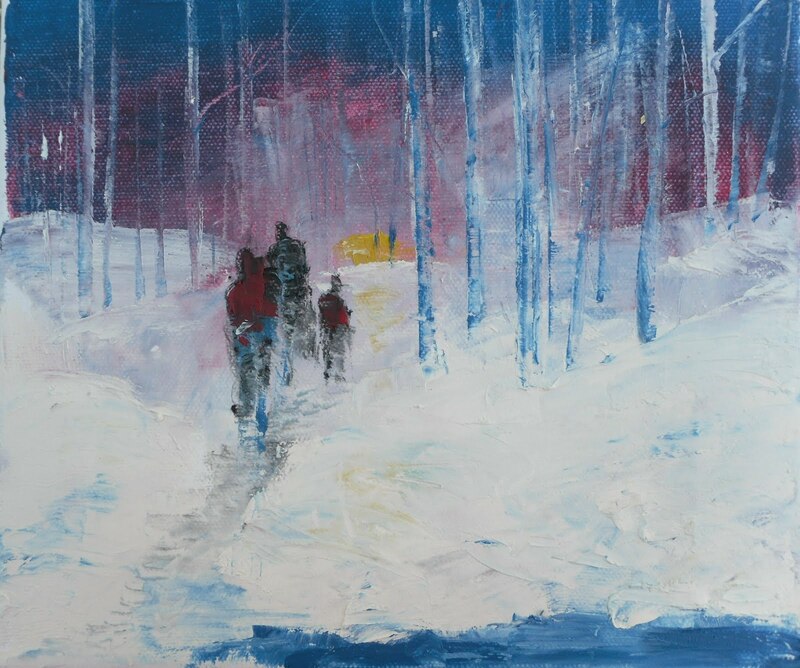 I put the stick directly on the canvas and used the knife and a piece of a plastic card as well to manuveur the paint. I left them outside overnight and this morning they were dry. Also of note…they are nontoxic. Have no idea of their archival quality, but they are fun to work with and I think I might like to show some and put on the label of the painting: “livestock marker on canvas”!! With the completion of these images, I have reached 90 small works. I intend to complete the 100 by the end of the month and I do think it will happen! I had some fun playing with some really strong colors of oranges and yellows. I also had a couple tiny frames that could use little paintings in them, so worked the really bright one in that horizontal format. But the most fun was doing the twilight painting with some stars flickering in the sky. 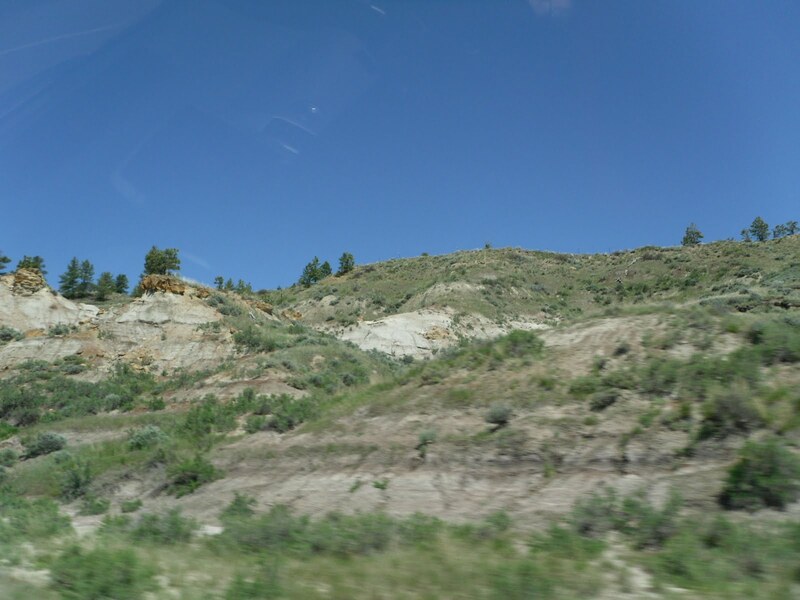 How that one came about…I am sitting with my son and family in their living room in Miles City, MT and my spot faces a west window. We were visiting and watching a movie about 930pm and I happen to look out the window at the last light of the day. It was incredible! The gradations of color in the sky could not be captured with a simple digital camera, but the image was imprinted on my brain. At the horizon there was a pale greenish-yellow that gradually turned to a gray-blue and then almost a teal higher in the atmosphere. 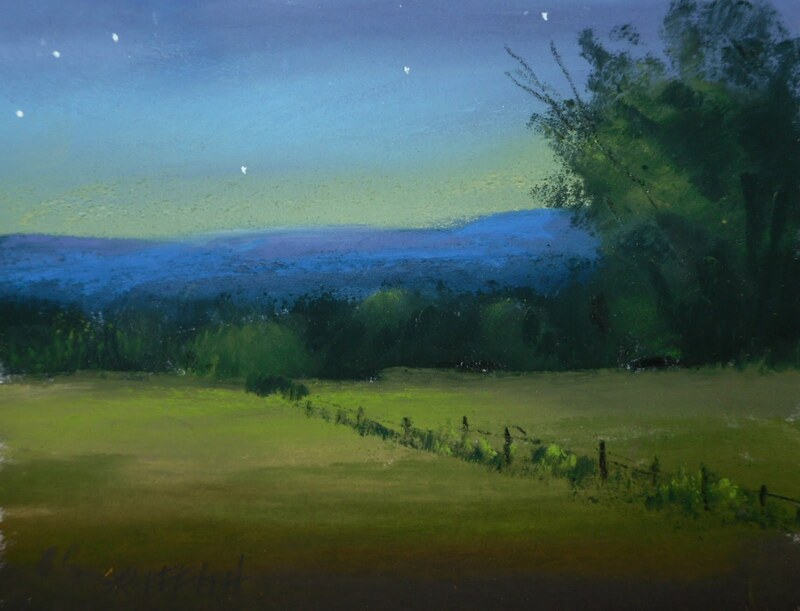 A few stars twinkled and there was a sliver of a moon near the horizon.This little painting is close to what I saw, but the teal is not quite the same. They call MT the “big sky country” and when you are out there in the plains, you can see forever and sometimes the night skies are really dramatic. I always love to go out and look at the Milky Way when I go there because the intensity of it is so much greater than what I see in SE WA. I am sure elevation plays a big part, but also the clearness of the air, I think. All these little ones were done on the Wallis sanded paper and I used mostly the Diane Townsend pastels which are really brilliant. 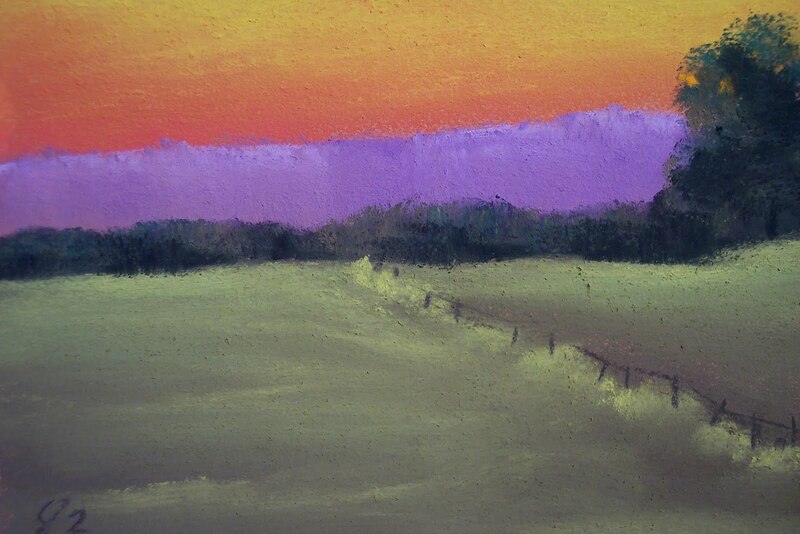 I like these pastels because of the grit in them and their ability to to be layered fairly easily. The next blog will take a detour from the series of 100 to a new experiment…watch for it!!! The dust has settled – for a moment – that is. After spending a great week in Miles City with stops in Lewistown and Billings on either end of the trip, we are back in eastern WA with a bunch of great photos for reference and some great memories of a time spent with family and friends and getting quite a bit of art completed. The Quick Draw photos are included in this blog. I can’t say enough good about that event. It is well organized, efficient and most of all the people who work hard to make this a highlight of the weekend are some of the nicest, friendliest people around. The artist posts were set up at various points in the Park by the water tower which offered some good shade for the artists. Big old trees also provided good spots for shade. 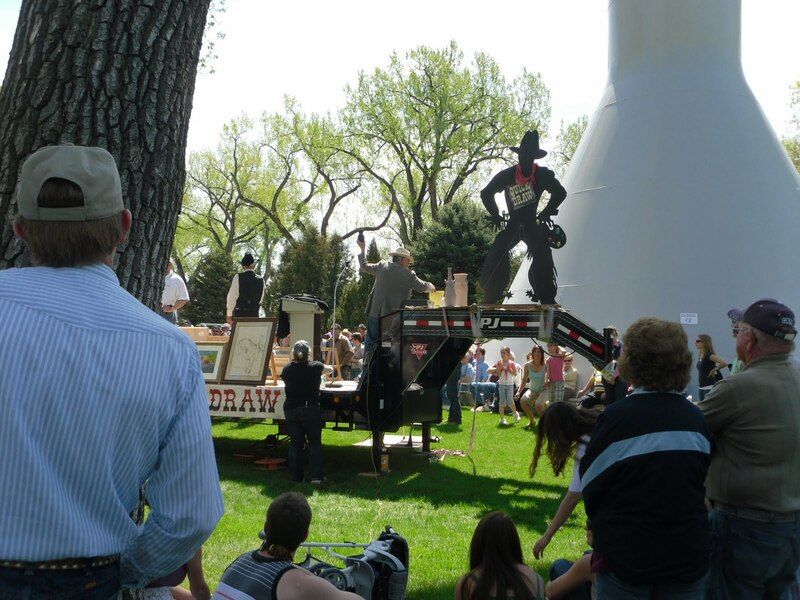 The art was auctioned from the flatbed trailer where the iron “cowboy quick draw figure” stood. 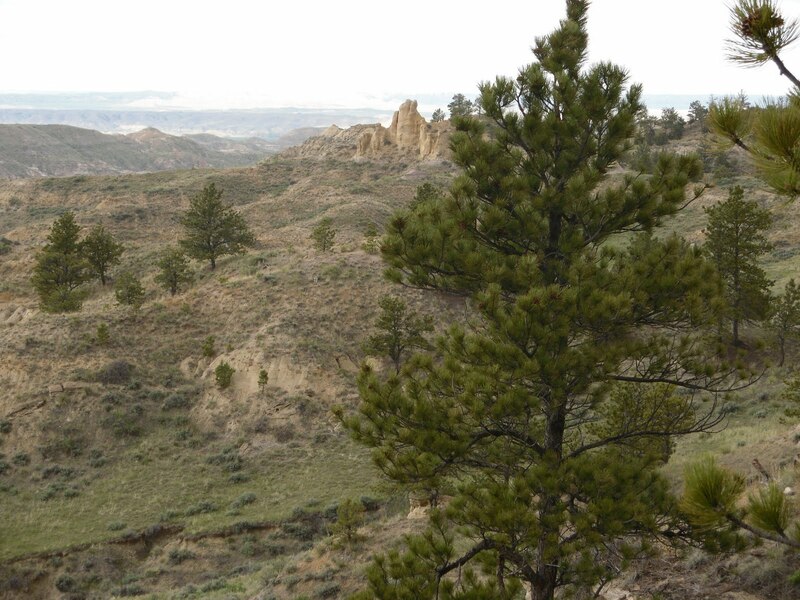 The view of the hills is out in the Strawberry Hills area – a recreation area that Chris and his buddies ride their mountain bikes through. It’s beautiful in a rugged way with lots of cliffs, rocks, steel hills and trails with really interesting strata in the land. It varies from a light tan to red to some black in the soil. The roads are interesting. 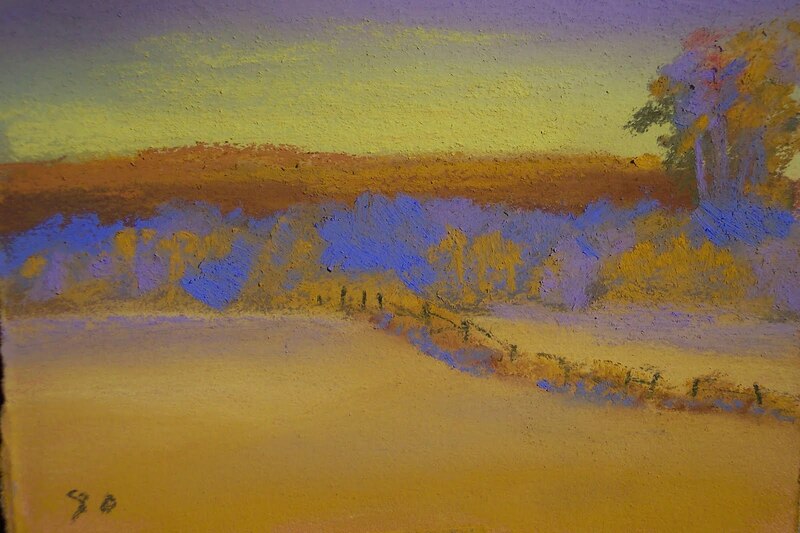 I took my pastels out there and set up and painted for a while. I only started getting a little nervous when Chris and Les were still out hiking around when the dark stormy clouds started rolling up over the hills from the northeast. These roads are not anywhere near considered “all-weather”! As it turned out, the clouds were merely a great show of drama and color for me because not hardly a drop of rain happened. This was a good thing! It’s a bit of a hike back to MC!!! I had thought that I might get some more of the series of 100 finished on the trip, but that didn’t happen. I was having too much fun hanging out with Michelle, Chris and Sam!! So this week the series should continue! A bit about the quick draw techniques…One doesn’t go to a quick draw event without a solid plan for your piece of work. Completing a piece in 30 minutes or even an hour takes good planning and some dry runs of drawing or painting the subject. I did change my mind a couple of days before on the subject matter basically because I was fighting with the details of the initial idea. That can’t happen. I knew I needed to change my plan and be confident with my subject and materials. 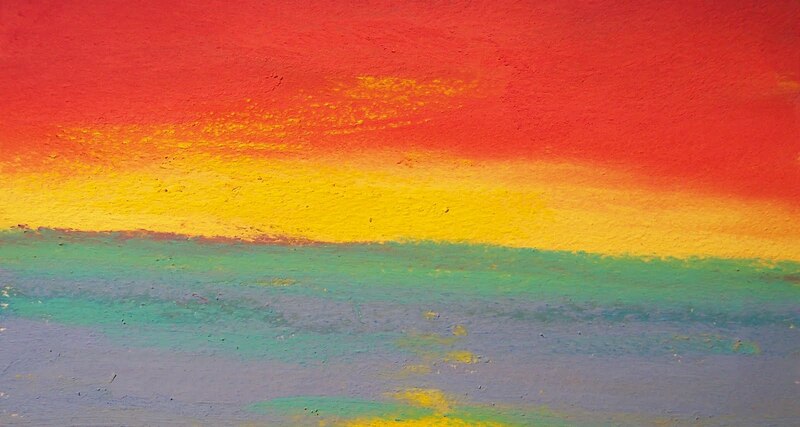 I chose, and then isolated the pastels that I would need to complete the painting so there would be no hunting through a hundred or more colors or the right sticks. I decided to paint it on a black primed paper…allowing the black to work for me in depth. I typically don’t like solid black so tinted the water area of the image with a very dark blue and under painted the trees with a purple – overlaying the yellows and oranges of the fall leaves. The purple added depth as well…why? Because of the play of the opposite colors on the color wheel – the yellows and purple working their magic. 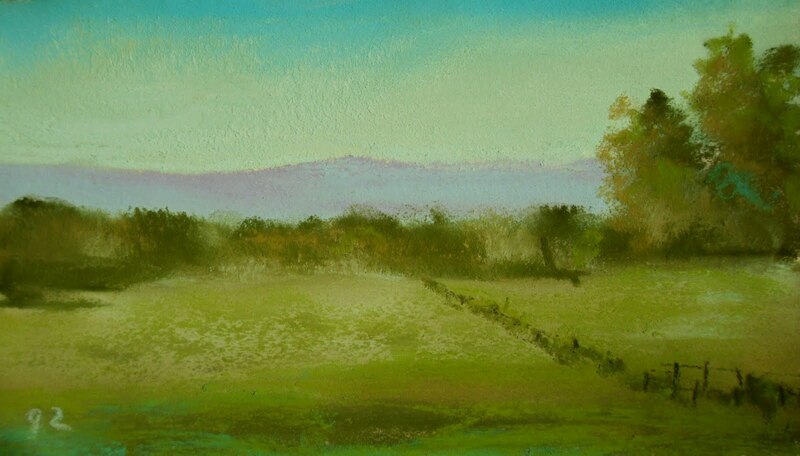 I chose my type of pastels carefully…using ones in the trees specifically that had a lot of grit which would allow more layers to be added…the Diane Townsend Terrages as well as some light spritz of workable fixative to assist with tooth in the paper and get a good layered look. The colored paper made the painting go faster because I did not have to add much depth color. Then the biggest thing…know when to stop painting! (and not the timer telling you when to stop!) I also did not use a reference photo…sometimes I can get too “pinched” – too detailed when I use a perfect photo…I have heard other artists say the same thing…it is like it the painting is wanting to be the replica of the photo in minute detail. So with events like this, know your subject, know you can create what you want in the time frame allowed, pick your colors before hand, have your set up ready before the start and this will give you the confidence to create something great! So with that said….happy painting! Being back in Montana in the springtime is always a treat. There is that sense of new with the new growth from the grasses to the wildlife. There is a relief that the winter season is in the past (hopefully). So driving to Miles City via Helena, Great Falls, Lewistown, Jordan and Cohagen was a pleasant journey of new growth, young greens, a hint of an early spring snow storm. We stopped in Lewistown only briefly to drop off some new work at Moccasin Mountain Gallery and visit with Jayson, Debbie and JoAnn. That gallery is feast for an art lover and western artifact with original work, great prints, horsehair items, a great frame shop lots more. It’s a place to definitely plan a stop at when one goes to or through Lewistown. Also visited with Betty and Al for a bit before heading east toward Miles City. Les says to me, “where do I have to turn to go to Miles City in case you are asleep?” I said, “keep going east on this road til you can’t go any further; then turn right.” And that’s about it. 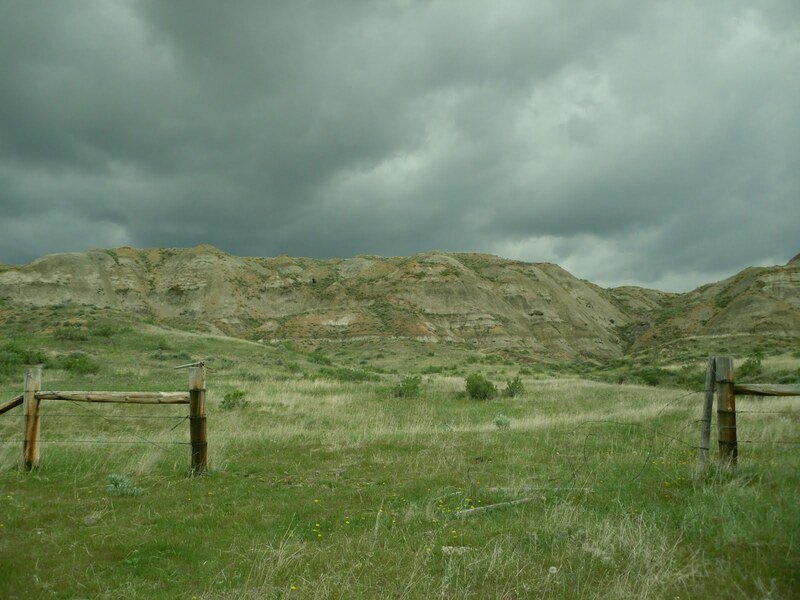 You drive through interesting country – badlands like -, rolling hills of the grasslands, some farm land, past some of the largest ranches in eastern and central Montana and not so many people. There aren’t many services between Lewistown and Jordan and likewise from Jordan to Miles City. Chris, Michelle and Sam live in MC and we are anxious to see them and to go to the festivities of the weekend with the art events, the horse races, bucking horse sale that all are part of the Miles City Bucking Horse Sale weekend – much akin to the Pendleton Roundup I hadd decided to enter the Quick Draw event which has been a part of the weekend for 20+ years and is a fund raiser for the Custer Country Art and Heritage Center (a must see venue in MC for art lovers). One half hour to complete a piece of art and another 10 minutes to frame. I had been practicing and timing what I could realistically do in a 30 minute time frame. 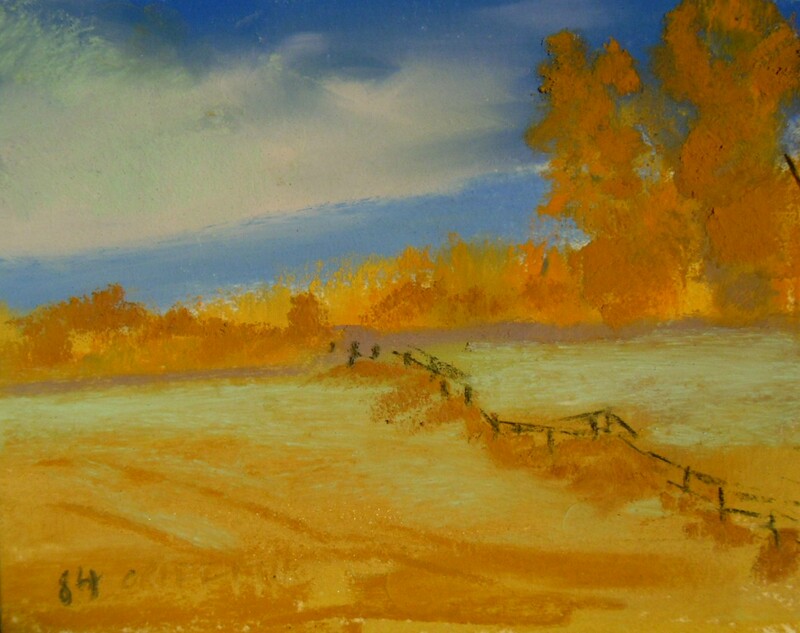 I painted “Fall Colors” an 8 1/2 x11 inch piece of cottonwoods by a stream. Once I started the piece, I felt it was going to go well…it’s a sense you get…it’s the one you want!!! Finished in 25 minutes and then to auction. There is always a bit of a fear that your piece might not sell for it’s value; but this one did. Highest bidded and sold piece at $1100. Wow! The art center and artist both share in the sale. Couldn’t have turned out better. This morning the art center hosted a brunch at the center which was fabulous with great food, music and drop dead gorgeous art show…Clyde Aspvig was one of the artists and I am a big fan of his incredible oils. 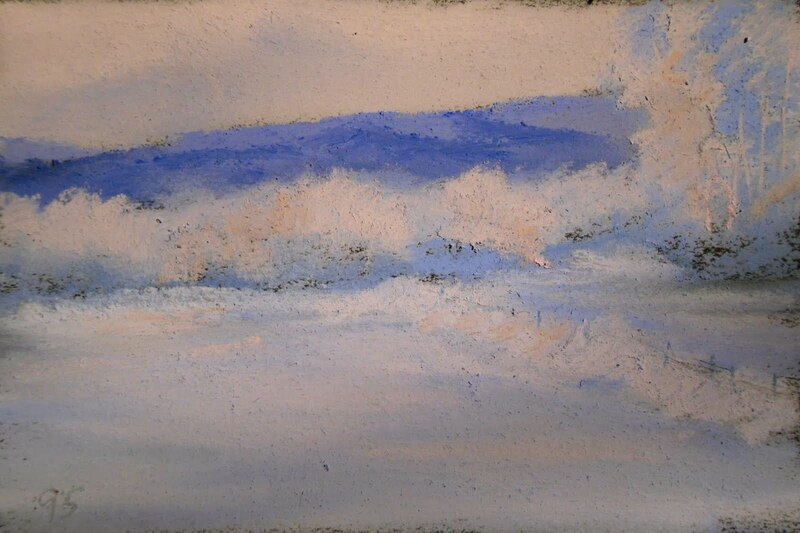 So I am posting the images 77, 78 and 83 in the series and a test on a tiny piece of pastelboard. The first images are about 5×7. I took some Wallis over to John Knapp’s studio a few days ago and joined the group of Wednesday night painters. It’s an enjoyable time; I just don’t get there very often! Since I was “traveling” I decided to take a limited bunch of pastels with me. 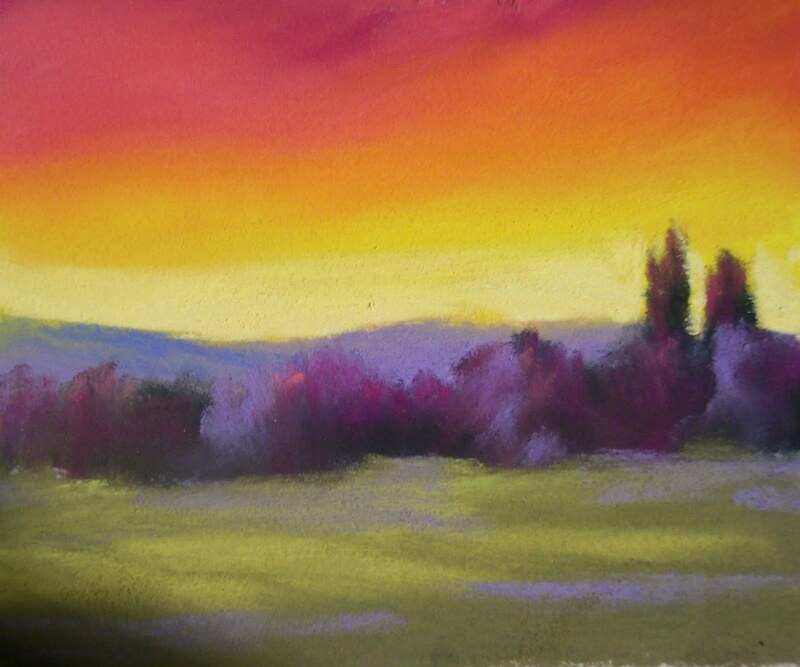 I a recently gotten some Diane Townsend pastels and had my landscape set of Richeson’s that I wanted to show John and Carlyrae. I found the Richeson seemed to work well and not quite as messy as the Townsend’s – probably because the Townsend pastels are pretty “gritty”. Oh they are beautiful color tho!!! So I opted for less mess since I was visiting John’s studio and stick with the Richesons. They are nice and soft and blend well as I worked on my “Charlie Russell sky” as Carly called it. It was here I decided to do my next experiment with the Townsends on a less toothy paper like Canson…and they worked well. The meeting was great. Denise Champion who is a masterful artist, did an over-the-top presentation that took some hours of prep. She had gotten some samples of pastelboard and each attendee was given one. 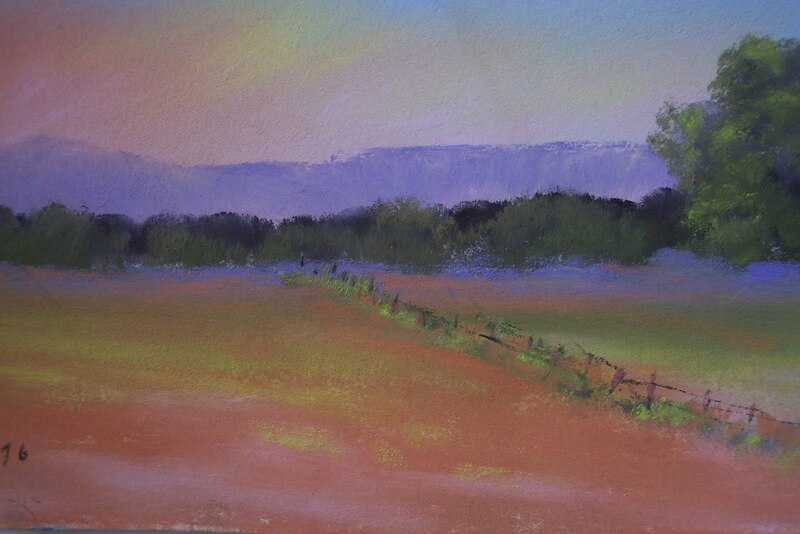 (Robyn from DA had also given each of us a sample of the new PastelMat – a competitor for Wallis. So this was enough for me to hit the studio and give them a test drive. I love the idea of the pastelboard because it is rigid and doesn’t have to have a foam core backing; it can stand a wash with alcohol for an underpainting or a good scrubbing if you really muck up the piece. Might try more of that. The PastelMat paper was nice! It doesn’t appear to have a lot of tooth, but remarkably does. so on that tiny little piece of paper I made #83 in the series. I changed up my talelest trees some and may do that for some variety with the next 17. The paper performed well and I liked it! 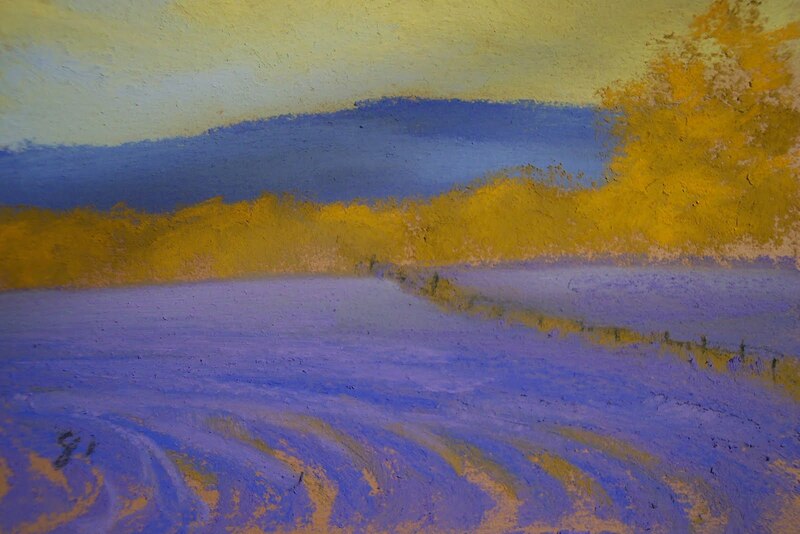 I used only Diane Townsend pastels on both of these tests and they worked beautifully. Her colors are outstanding; so brilliant and wonderful! So now it’s to MT to do the Quick Draw for the Custer Co Art Center and drop of new things at Moccasin Mountain Gallery in Lewistown. 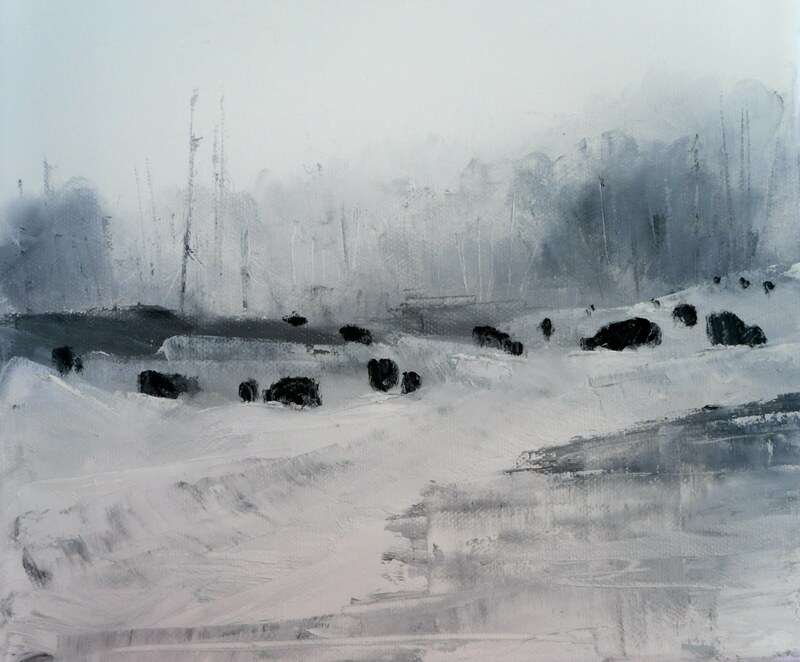 With any luck the snow is gone and I can paint in the quick draw without mittens! Happy painting…and try some Diane Townsend’s pastels…2 different types of pastels..some with a little grit and the Tarage’s (sp) with more grit. Great products!! The images if 77 and 78 are not yet posted; these are 79-82. And I actually had an “Aha!” moment with that started with the images 77 and 78. 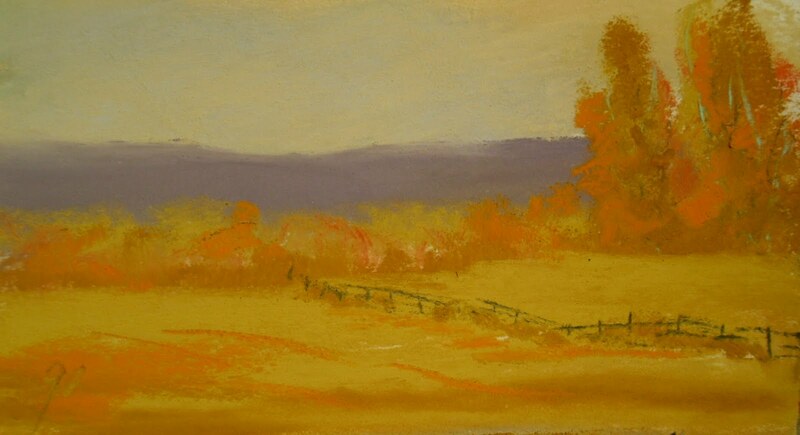 Using Richeson pastels and some Diane Townsend on Wallis, I found the Richeson liked the toothy paper best…so when I started to paint 79 I decided to try the Townsend pastels on Canson paper because those pastels are quite “gritty”, if you will, compared to Richeson, Sennelier, Schmincke, etc. 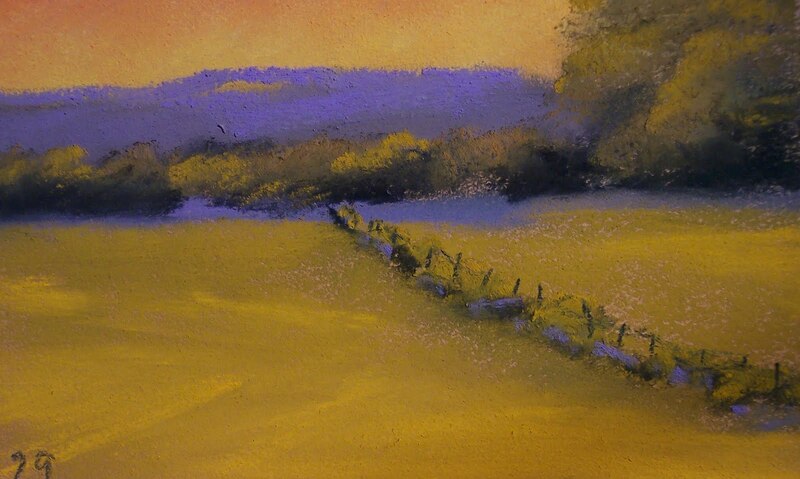 With the Canson paper being pretty light and not much tooth, I thought the perfect combination might be the Townsend pastels with the Canson paper. Aha! They work well together! I put together some maybe strange color combinations; but the pastel went on the paper well and I think more layers could be added without filling the tooth of the paper. 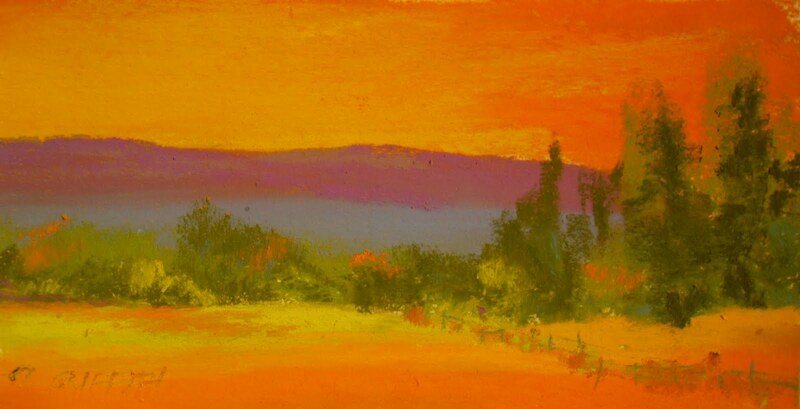 I don’t have a large number of the townsend pastels, but I certainly liked how they and the Canson paper worked together. I will try some Unison exclusively on Canson next and see how they work. 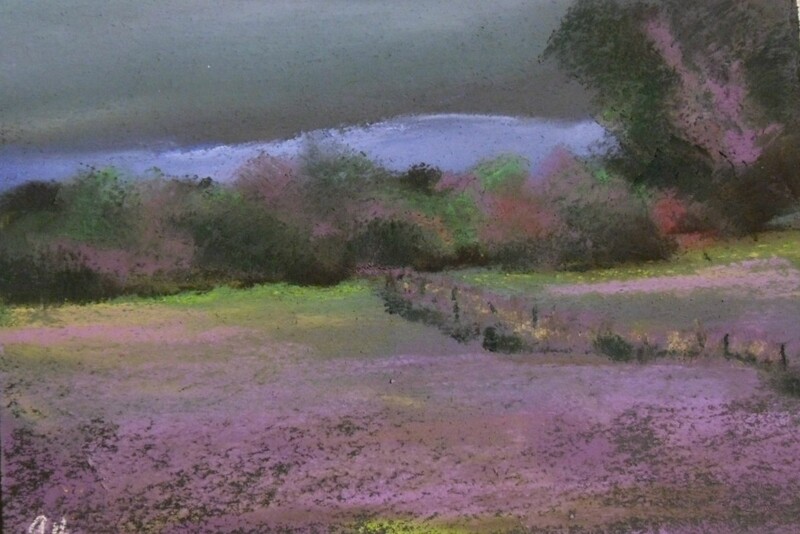 I have not used an exclusive brand of pastels since the infancy of my pastel experience and when using the Canson paper, was always just very careful to not overload the paper with pigment. I am not advocating just piling on any pastel; but when you find what works well together, you do feel good about the process and not be dissatisfied with the results or the process to complete the painting. All the brands of pastels have a bit of a different feel and why not figure out which pastel works the best with which paper. We all have our favorites and for the most part we all use a combination of pastels in a painting because some brands just don’t have a certain color that some other brand does. Anyway, try it! It’s a good match!